Sufix®, the trendsetter in fishing line, continues to set the market on fire with the introduction of Sufix 832® Advanced Lead Core, the first lead core line to combine both Dyneema® and GORE® performance fibers. "This is the strongest, most versatile lead core available," boasts Al Lindner, legendary angler and National Freshwater Fishing Hall of Famer. "It's ideal for trolling and big-game species because of the added strength and extreme sensitivity." When compared to other lead core lines, Sufix 832 Advanced Lead Core dives 30 percent deeper and is a whopping 70 percent stronger and infinitely more sensitive. "The composition of these two fibers braided around the lead core wire creates the most abrasion resistant, roundest, UV protected lead core line on the market," said Lindner. With 10 color sequences, anglers can confidently get baits to the preferred depth with ease, and with three times the abrasion resistance, all underwater obstacles can't wear this lead core down. 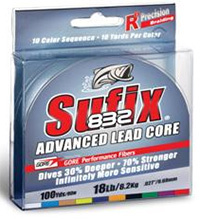 Sufix 832 Advanced Lead Core is available in 12- and 18-pound test in 100- and 200-yard spools. "Anglers may wonder why this line is only available in 12- and 18-pound test. Simply, this lead core was designed to be the smallest diameter, accented with superb strength and sensitivity - so no matter what species or application, this lead core handles beyond expectations," explained Lindner.